If you like your online casinos to come with a strong sense of fun, then read on, because you are likely to find a lot to enjoy about PlayFrank. 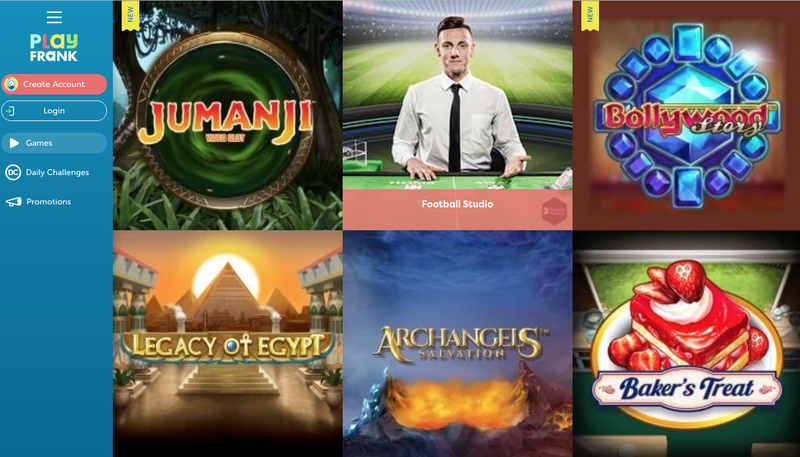 This popular casino has seen its number of players increase since its launch as players have connected with the tone of the site, as well as its impressive selection of games and promotions. However, PlayFrank was only launched in 2015. As much as this fact makes the site feel like something of a veteran considering the sheer number of sites that have arrived since, but this site is still a relative newbie, and may be riding the wave of popularity that many sites enjoy in the time following their initial launch. What this means, is that PlayFrank does not have the ability to rest on its laurels and expect the customers to keep coming, a lot of work has to go in on a continuous basis to keep the site relative, and competitive. So, does PlayFrank have what it does to maintain and improve its position? Or is this is a site that is going to slowly drift into the middle of the pack after such a promising start? Upon your arrival at the PlayFrank site, you will be met by a small blue alien (I assume he’s an alien?) who is called, yep, you guessed it, Frank. Frank isn’t the only blue part of this site, in fact it is almost entirely blue, except the logo, which uses red, yellow, and green as well. The shades of blue utilised here may seem surprisingly subtle considering how much is going on within the design, but if you think about it for a second, we can all agree that this is a choice we thoroughly appreciate. Instead of a loud, noisy, brash site with too much brightness and so much going on you don’t know where to look, the colour scheme here provides a perfect backdrop for all the playful and cute design touches that are scattered around. Despite the complexity of the design, navigation is anything but complicated, with all aspects of the site easy to find from the homepage, whether you’re looking for games, promotions, on information in PlayFrank. Putting a lot of design into a site has gone badly for more sites than it’s worked for, but PlayFrank has avoided all the traps, and thus, it looks great. Being competitive in the modern market includes having a huge selection of games, and a decent batch of software developers providing them, otherwise you will lose out to those that do. With well over 1,000 games on offer, coming from the likes of BetSoft, ELK Studios, Endorphina, Evolution, GamesOS, IGT Interactive, Microgaming, NetEnt, NextGen Gaming, NYX Gaming, Play'n GO, and Quickspin, to name a few, PlayFrank is clearly aware of this necessity, and therefore offers gaming choices that are amongst the best and most varied you’ll find online. New releases for slot lovers include NetEnt’s two most recent offerings (at the time of writing) Jungle Spirit: Call of the Wild, and Wild Wild West: The Great Train Heist, as well as the likes of Dragonz, Cloud Quest, lost Vegas, Motorhead, Game of Thrones, and a great deal more. If casino games are more your thing, then you’ll love the table and card games on offer here as well, with a variety of poker, blackjack, roulette, baccarat, and more. If you are a lover of online casino sites, and you are yet to have experienced PlayFrank, then you really are missing out. This is a site that offers everything you could want from an online casino, and in a great looking package too!